Memorial Hospital of Rhode Island (MHRI) has provided world-class primary health care for over 100 years and serves as a teaching affiliate of The Warren Alpert Medical School of Brown University. MHRI staff, colleagues, and friends commissioned Ahlers Designs to create an art sculpture to honor Thomas L. Ross’s 40 years of service to MHRI as Vice President of the Environmental, Property Management and Support Services Division. Gail Ahlers took a sustainable approach to the sculpture’s design by reclaiming local materials. The striking gear, gauge and wood were obtained from hospital facilities. They are mounted on a reclaimed multiple-level wood base that was sourced from an old hospital door, using the door’s screws to mount the gage. 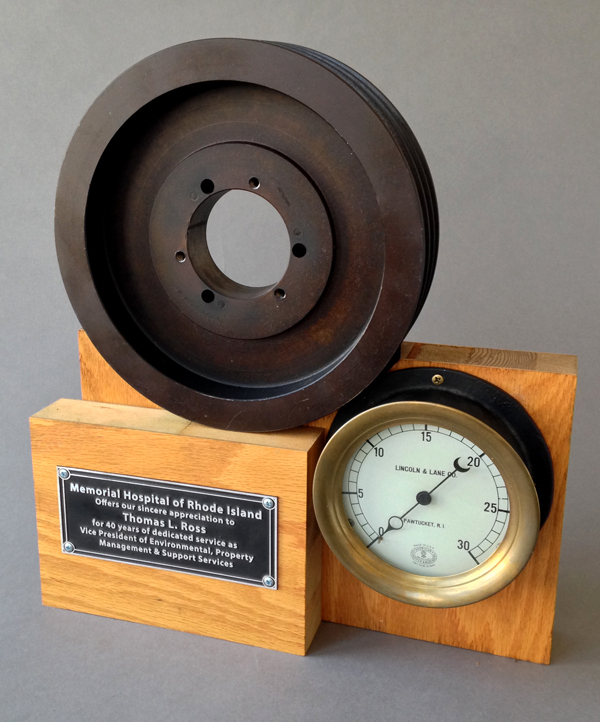 The antique gauge was manufactured by Lincoln & Lane Co. of Pawtucket, RI, and imbues the sculpture with local history and the pride that comes with creating art made in the USA.